Hi, I’m back with a roundup of Gerties Shirtwaist dress, although this dress was a complete nightmare stitch from beginning to end I would make it again, and here are the reasons why mainly it is amazingly comfortable and partly because half of the problems I had would have been avoidable had I spent more on copying the pattern and the publisher had proofed the pattern sheets more effectively. A complete novice probably couldn’t have put the dress together on their own but a novice with an experienced dressmaker on hand for advice would be able to create this dress. case in point, Denise has made a couple of garments but not one from a book where you need to trace out the pattern, don’t get me wrong Denise is totally capable of working it out for herself but it is easier if she has someone to ask. Do you want to see some pictures? of course you do. as you can see, the dress is a little tight across the top of the bust but that might be a follow on for the sleeves being too tight across the top of my arm. Otherwise it is quite a nice fit. yes the collar is doing something wafty but neither of us noticed when we took the photos, again I not sure if I’m standing funny or it would probably hang better if I didn’t have my jeans on under it. you can see how tight it is across the sleeves. I do like that there isn’t too much blouseyness going on across the back. We both used self covered buttons me mainly because I couldn’t find any other buttons that worked. If Denise was to make this dress again I think she would agree with me that we can lose some length from the bodice and may be some width from the shoulders. the sleeves are nice and lose, and you can clearly see the extra puffyness I was complaining about on a previous post, but Denise likes that so that is alright. here is Denise’s finished dress you can just see the buttons, we were a bit concerned that the front wouldn’t be quite wide enough over the bust, but that appears to be all right. we forgot you give you a hands in pocket shot, but the pockets are nice and roomy mine could probably have been slightly higher, but it does mean I won’t be continuously putting my hands in them. 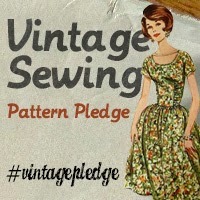 The next dress that we are looking at doing is the seersucker dress, what I’ve said to Denise is that we will take more measurements first before cutting out the fabric. sorry for the delay in posting the results of week 4, I spent Wednesday evening alternating between being hot and cold and then went down with other flu type symptoms, not conducive to sitting down and concentrating on blog posts. We managed to get the collar and the facings though not without some issues, mainly with not marking pattern pieces up correctly. I cannot stress enough if you are using this pattern book, check and double check all tracings and mark the T s from the pattern to your fabric. 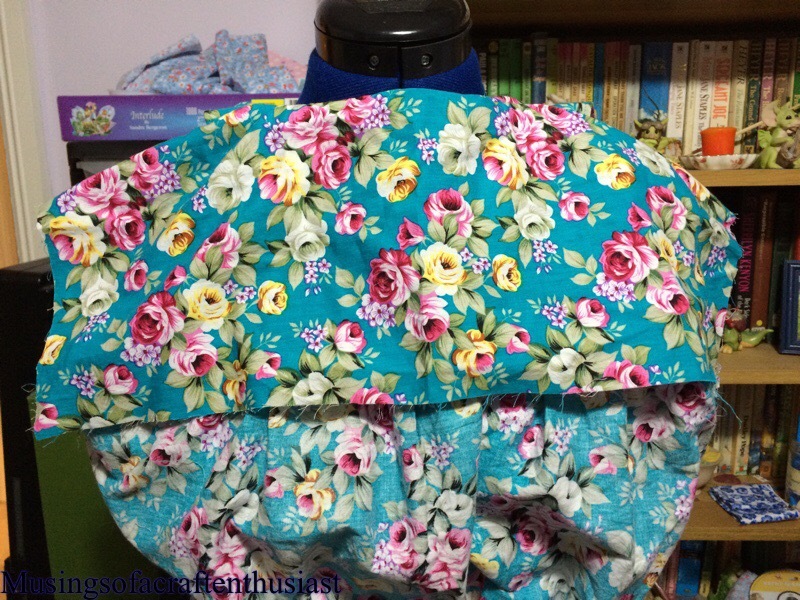 Denise’s waist matched between the facing seam and the dress front seam, mine was about and inch and a half out, obviously my skirt facing was going to be too long as I hadn’t shortened it to match my shortened skirt pieces. I lined up my collar with the centre of the back seam and centre of the collar, I also lined up my collar notches with the notches on the front of the dress. It seemed to go on all right we both had a couple of issues with a fold in the fabric round the collar but other wise pretty painless, as it was about 10:30 by this time we decided that we would do the slip stitching during the week so that all we had left was the button holes and hemming. 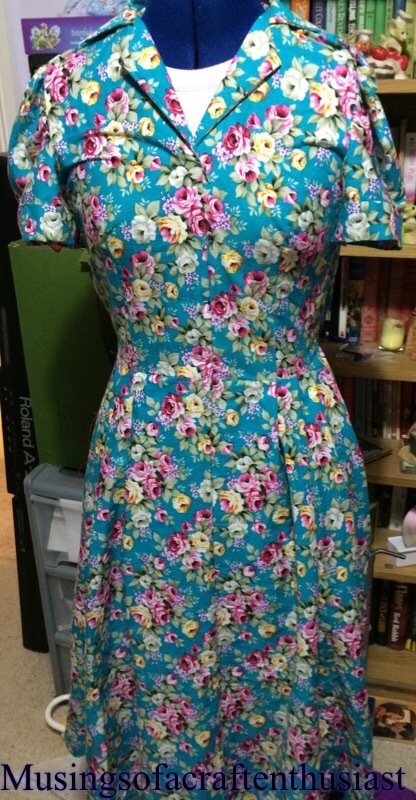 I wasn’t totally happy with the way my back facing was sitting but I figured that it just needed trimming and snipping, it wasn’t until the weekend just gone, once I felt up to wrestling with my dress that I put it on my dress form to look at it properly. The first thing I noticed was that the pleats were wrong on one side of the dress, the pleats were all facing the same way doh!!! so I unpicked that part of the waist seam and folded them the way they should go. The second thing I noticed was that the collar wouldn’t lay flat. I started trimming away the excess fabric which was when I discovered I’d somehow managed to catch part of the collar which I shouldn’t have when stitching on the facings and added to that there was a large fold of facing fabric where it should have been flat. I undid the iffy bits of the neck line and put it back in again, trimmed it all up and snipped the edges. the collar lay nice and flat now, unfortunately it wasn’t symmetrical, the collar was noticeably off centre boo!!! I took the whole collar off checked the marks they all lined up, the collar was still off, in the end I ignored the marks and used my tape measure. Here are the picture of how it look now, unfortunately I forgot to take any before pictures. This weeks sewalong (10th)had to be put off as we were both not well, but hopefully the dresses will be finished next week. I have done a couple of alterations on my Shirtwaist dress, and now it looks much better. 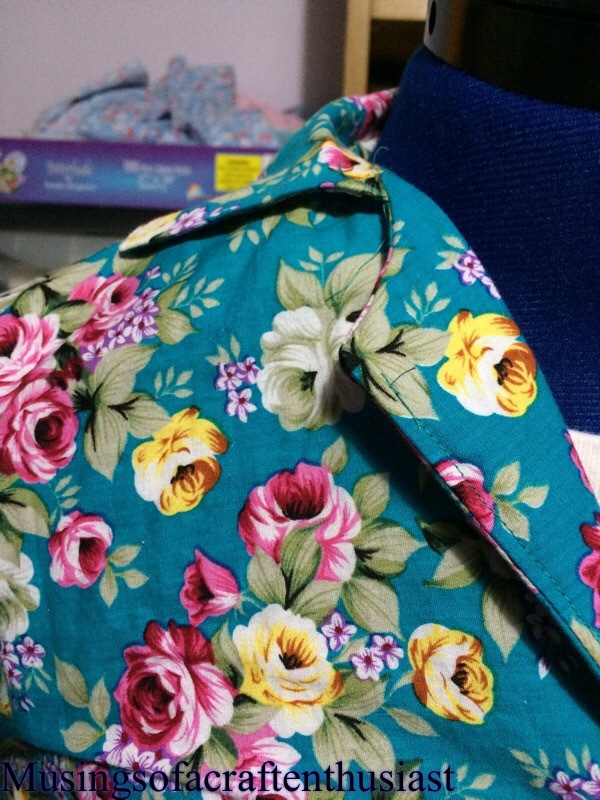 After removing the sleeves and undoing the under arm seam, I redid the seam with a 3/8 inch seam instead of the 5/8 seam which gave me an extra 1/2 inch. Using the pattern from my New york 444 pattern I have increased the arm sync on the front, I also redid the under arm seam by the same amount as the sleeve. After trying it back in the armhole, it was still too puffy so I removed a couple of millimetres from the entire top of the sleeve head going from the single notch to the double notch.